In two previous articles on the site, I’ve been able to ask both former Georgia Tech quarterback Josh Nesbitt and former Navy quarterback Ricky Dobbs how to read the stack. The Nesbitt article is here, and the Dobbs article here. Both of them have essentially said the same thing. The issue is the trust level of high school coaches. I get e-mailed this question seemingly on a weekly basis; “how do you get your quarterback to read the stack”? If they don’t ask that question specifically, I get some form of, “what makes me nervous about running the offense is having my quarterback read stacked defenders. Whether it’s a 4-3 or a 3-3 defense, you are going to see stacked reads. What I mean by that is shown in the picture below. If Tech runs 12 in this situation (triple option to the right), both the dive read and pitch read are stacked behind each other. Your quarterback must be able to handle this singular situation if your offense is to have season long success. So what suggestion did both quarterbacks have? They were the same- have your quarterback read the area. They must be able to see both defenders at the same time. It has been suggested in face to face conversations that by reading the area, what they are really looking for is movement from #2. If #2 doesn’t move on the snap, then the quarterback can focus all of his attention on a correct read on #1. Reading #1 correctly takes hours of reps. You need to teach your quarterback all the various ways the dive key can attack the dive. I’ve always had a steadfast rule of thumb: If the dive key can tackle the dive, then pull the ball. His feet usually give it away. If he crosses the line of scrimmage it’s a give. The only way he can make the tackle on the dive (assuming your splits are wide enough and the speed of the B-back is adequate) is by coming flat down the line of scrimmage. Ricky Dobbs has another key for you as well. He has said that a defenders hips don’t lie. They may be able to play games with their shoulders, but their hips dont lie. If he doesn’t turn his hips towards the ball, he can’t make a play on the B-back. 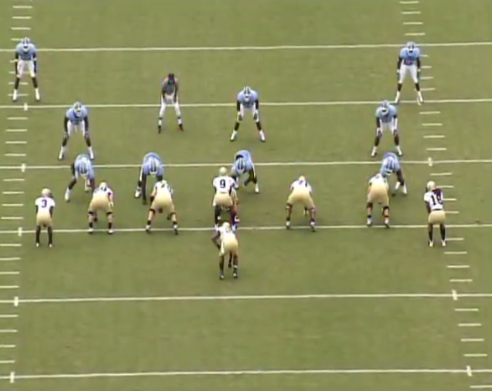 If #2 does move inside he’s effectively closing down the option path for the B-back. I tell the quarterback to “read the track”. If there is a defender on the track pull the ball. If #2 is cancelling the dive, expect a quick read and likely leverage pitch on #1. What’s the best way to rep this for your quarterbacks? The reads have to be live in game like situations. They is no shortcut for live reps. If your individual defensive players cannot simulate a live rep, put a coach in there. Someone has to be able to give the quarterback proper reads. The stack has to be read, it will give you the best technical advantage possible to run triple option. The best way for your quarterbacks to learn is by “reading the area” through live reps in practice. Good luck to all of you out there as your season gets under way.